Spring! The promise of hope. The start of the growing season. The warmer temperatures and fickle weather. The possibilities of what can be done! I love Spring! Winter is over except for the possibility of a late snowstorm. Summer is coming. You can be outside most of the time without freezing your gluteus maximus. Which is a good thing because there is so much to do in the Spring on a homestead! 1. Start seeds inside. Check out your planting zone, but now is a good time to start onions, tomatoes, peppers, and other things you might buy as plants at the store. 2. As soon as your planting zone allows, plant seeds in your garden. You can plant radishes and other cold hardy vegetables and greens as soon as the frost is out of the ground. Most of them will survive a late frost also. 3. Fix fences. Winter can be harsh on your fences. While the ground is fairly soft (not soggy), now is good time to put new stakes in the ground and pull up old ones. 4. Fix damage to outside buildings. Did you have a roof leak on the coop? Now is a good time to address it. Did the snow and rain damage the sides of the building? Now is also a good time to address that. 5. Get new chicks! Spring is a great time to start a new flock or add to the current one. Anyway you look at it, new chicks are cute and should be on a homestead! 6. While you are getting chicks, some new turkey poults, goslings, and ducklings would be good too. If you are looking for some different forms of protein in the form of eggs and meat, all of these are great. If you really want to and have the room and shelter for them, goats, lambs, calves and piglets are all great additions to the homestead too! 7. Build a new raised garden bed or make a new garden. If you can expand, now would be a good time to do. 8. Clean up the yard. Get the rocks out of the lawn so you don't ruin the lawn mower or break a window. 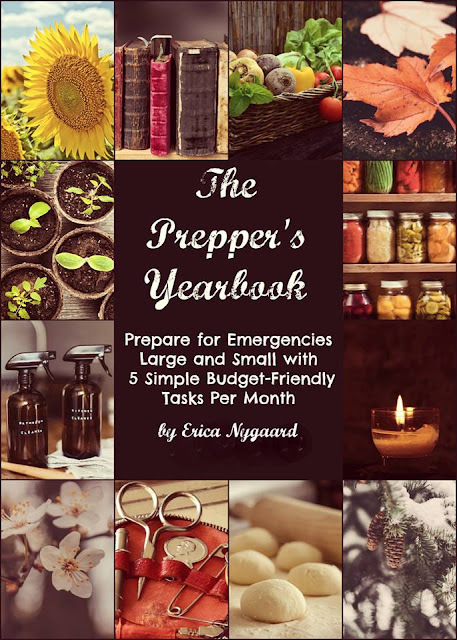 Clean up the trash that has blown over from the neighbors. 9. Pick up the sticks and branches that fell over the winter. At my house, this gets it own number on the list. We have a lot of trees and we seems to lose a lot of branches over the winter. 10. Cut down the dead trees. Cutting down the trees now will give the wood time to cure if you are using a wood stove. Otherwise, make a little money on the side selling firewood. 11. Plant new trees. I am a big believer in planting trees. We need them for the environment. They provide a great wind break and shade from the sun. If you plant fruit or nut trees, you can add to your food resources. 12. Clean out the buildings. The garage, the coops, the barn, all of it. They all need a good Spring cleaning after winter and being closed up. 13. Build a rabbit hutch and start raising rabbits. Rabbits are a great form of protein and good eating. If you end up with more rabbits than you know what to do with, start selling them to make a little income on the side. 14. Spring clean the house. A good homestead works best when the house is clean, tidy, and organized. Get everyone involved and give the house a good cleaning including washing the windows and the curtains. 15. Clean the outside of the house and buildings. A good cleaning of the buildings keep the place looking neat and tidy. It also keeps the mold off the house, the dirt from building up in the crevices, and problems from happening like leaks and corrison. Don't forget to clean the gutters too! 16. Take care of the clothesline. Nothing smells better than fresh laundry and the money saved from doing it. Now is a good time to tighten up the lines, replace any lines that have cracked or rusted, and clean them. I just use a wet rag over my hand and run my hand down each line 3-4 times. You would be surprised how dirty they are! 17. If you don't have any, now is a good time to set up a rainwater catchment system. It is as easy as setting a screened barrel with a spout under a downspout from a gutter to catch the water. You will save money not having to run your well or pay for the extra water. You will also have water on hand for livestock or watering plants if you lose power. 18. Want chicks, but don't have a coop? Build a chicken coop! There are some specific things they need like an enclosed area, nesting boxes and a roost, but they don't need a lot of room. You can make one fairly cheap with reclaimed materials too. 19. If you haven't already done this, plan your garden. What do you want to plant? What worked last year? What would you like to preserve and can? What do you actually like to eat? Last year, I planted 22 tomato plants and I am glad I did. I had a really decent harvest with plenty to can and to eat. This year, I want to plant at least that many, but I need a better staking system. I want to plant more peppers too. I only had four plants out of sixteen produce. I need to plant them further away from the tomatoes that tried to suffocate them. You need to consider things like that when planning your garden. 20. Start some beehives. Spring is a good time to get some beehives started. With bees being endangered, more people need to do their part to start raising and homing them. You can purchase a beehive kit from Amazon to get started. To get bees, talk to local beekeepers or your local extension office about where to purchase them. In addition to getting bees, plant some bee loving plants and bushes around the homestead to keep them fed! 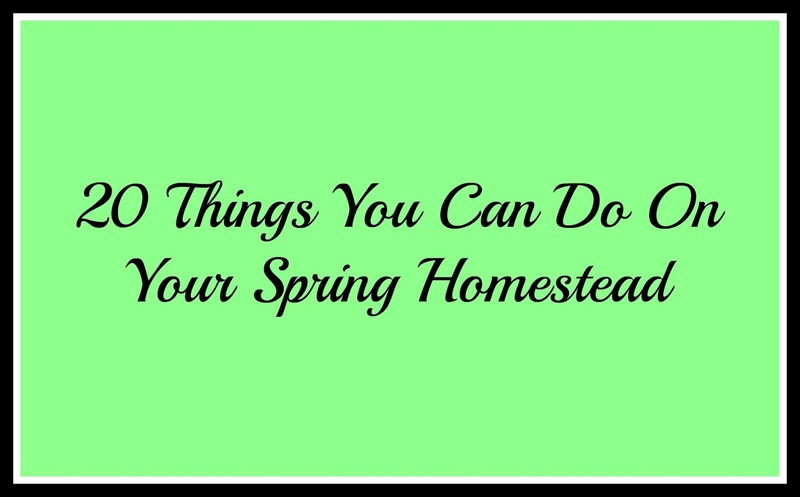 What do you want to do on your homestead this Spring?